These hand-stitched prosthetic breasts, dubbed 'Knitted Knockers,' have proven popular with women who have undergone mastectomies. "These knockers are light. They're washable and they're free," said Denise Weinberg, co-chair of the volunteer group. The complaints are not unusual, nor do they vary too much. Prosthetic breasts provide an important resource to many women who have had mastectomies. But they tend to be uncomfortable. "Typically, when women go to a fitting place or a medical supply store, it's a heavy, breast-shaped, silicon form that goes into the bra," said Dr. Kristin Brill, program director for The Janet Knowles Breast Cancer Center at Cooper University Hospital's MD Anderson Cancer Center. "It's meant to go up against the skin, so it doesn't move around a lot. It tends to be heavy and hot." 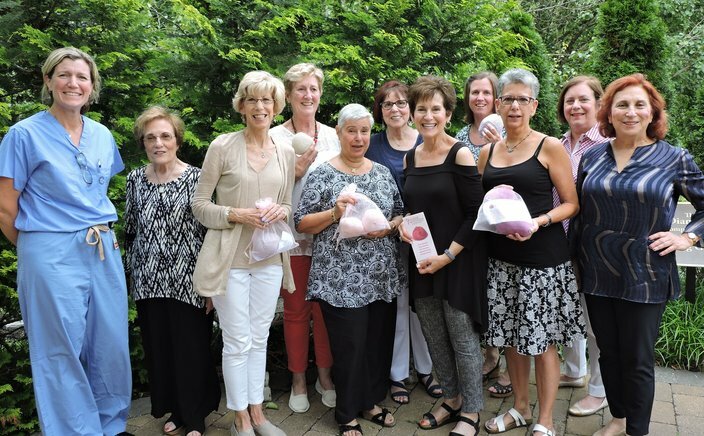 Now, South Jersey women have an alternative, thanks to a group of 25 volunteers who are busy knitting and crotcheting hand-stitched prosthetic breasts, affectionately dubbed "Knitted Knockers." 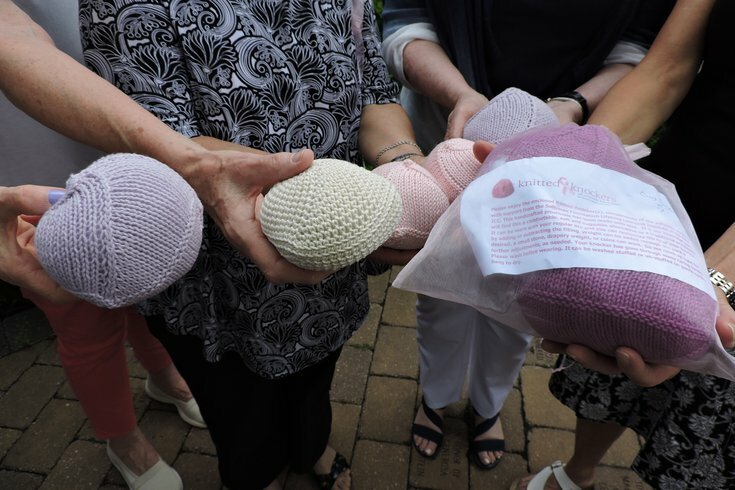 The group has distributed more than 100 pairs of Knitted Knockers since December to South Jersey hospitals, including those in the Cooper and Virtua health systems, according to co-chair Denise Weinberg. Filled with Pol-Fil, the Knockers are softer than standard prosthetics and can be worn inside a traditional bra. They come in a variety of sizes and colors. "Some people are dissatisfied (with standard prosthetics) because they're heavy, or sweaty in the summer, or they're expensive," Weinberg said. "Clearly, these knockers are light. They're washable and they're free." The South Jersey volunteers are an affiliate of the national Knitted Knockers nonprofit founded in Washington in 2011. The volunteers are funded by the Saltzman Foundation Life Long Learning Institute in Cherry Hill. "Some groups are just knitting and sending them to a central location for distribution," Weinberg said of other affiliate groups. "We're knitting and trying to keep them in South Jersey, because our funding is coming from South Jersey. And we live in South Jersey." Dr. Kristin Brill, left, of MD Anderson Cancer Center, poses with members of the South Jersey 'Knitted Knockers' volunteer group. The women have distributed more than 100 pairs of stitched prosthetic breasts since December. The Knockers have been a hit with patients at MD Anderson Cancer Center, Brill said. "I wasn't really sure how popular they'd be, or how well they wore," Brill said. "We offer this to put into the post-mastectomy camisole or post-mastectomy bra. It seems to make them comfortable and they're happy with them." Some women even request different pairs for daytime and nighttime use, Brill said. "I would say in a month, we're probably giving out at least 20," she said. And the group has no intention of slowing down. Weinberg guessed the group's members have another 100 pairs ready to be distributed. "Once our knitters start knitting them, it's hard to get them to stop," Weinberg said. "As long as we keep feeding them yarn, we'll keep knitting them."